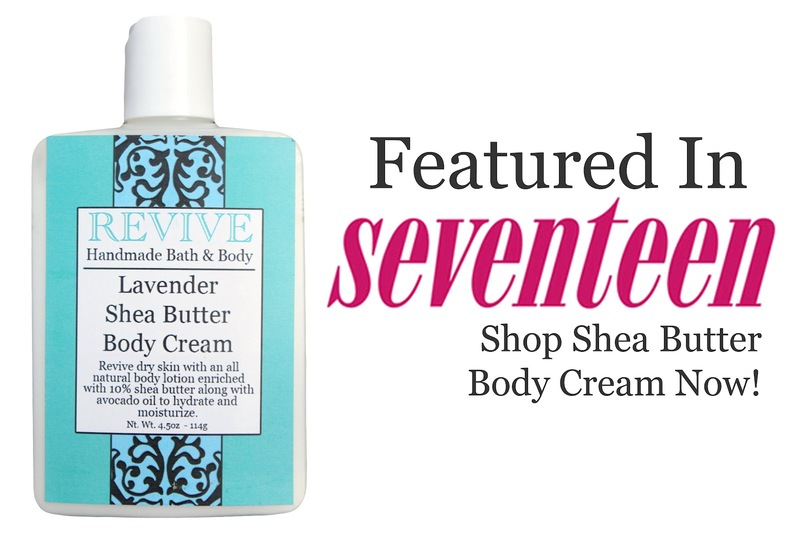 Revive Bath & Body: SEVENTEEN!!! I am excited to announce that my lavender shea butter body cream was actually featured on Seventeen.com! The Lord has been blessing me and my company recently in ways I could have never imagined. Whenever you feel like giving up, give it to Him because He will provide! I sent several editors of different magazines product samples and also wrote a letter to each of them telling them about my business and how it all got started. I never really thought I would actually hear back from one of them! Jessica is a web editor for seventeen.com. She chose my lotion as her Product Obsession of the Day! I am ecstatic!!!!! On Thursday, I am going to be traveling to a shop called Eco Denizen in Atlanta, GA to do a product demonstration. They are interested in carrying my products so I am very excited about showing them what I have to offer their store and their customers. Keep an eye out for my next post - it's going to be all about my new soap!! It is scented with rosemary, peppermint, spearmint, and lemon - YUM! I've been reading your blog and looking at your beautiful soaps. Your package design is great and your booth displays are really inspiring. Oh my goodness Marie thank you!! Your kind words mean so much to me!! So cool! So happy for you! Thought I'd posted in regards to this post. Congrats, did Seventeen just find you online or did you send in your products? I'm always curious how people get featured in high profile magazines.